As easy as Pie — Apple that is! For all the years I was growing up my Mom was a stellar apple pie baker. She never made just one pie- always two- one for dinner and the second one for breakfast the next day. As to her secret, she claimed it was all in the apples . Macintosh were too soft, Granny Smith were too firm, but Cortland were JUST RIGHT. 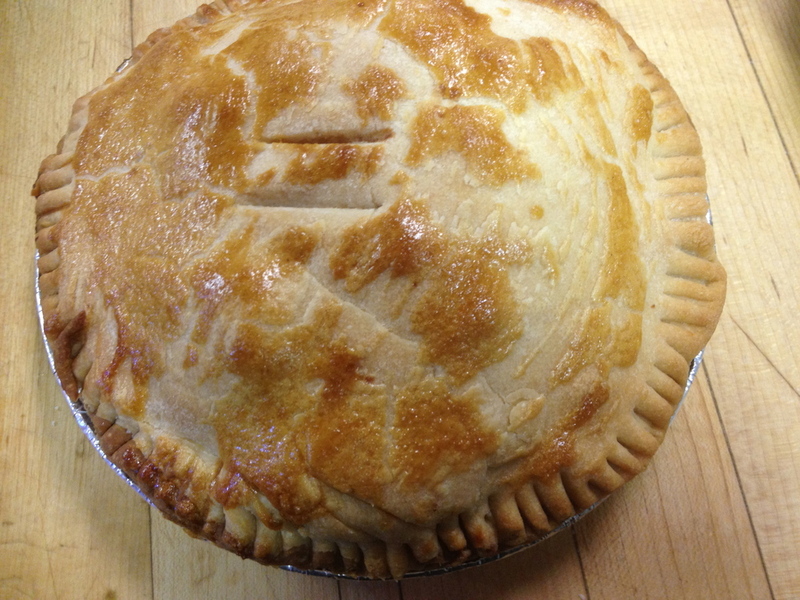 As such, I have always waited until Cortland's appear in the market before baking my own pies for the season. 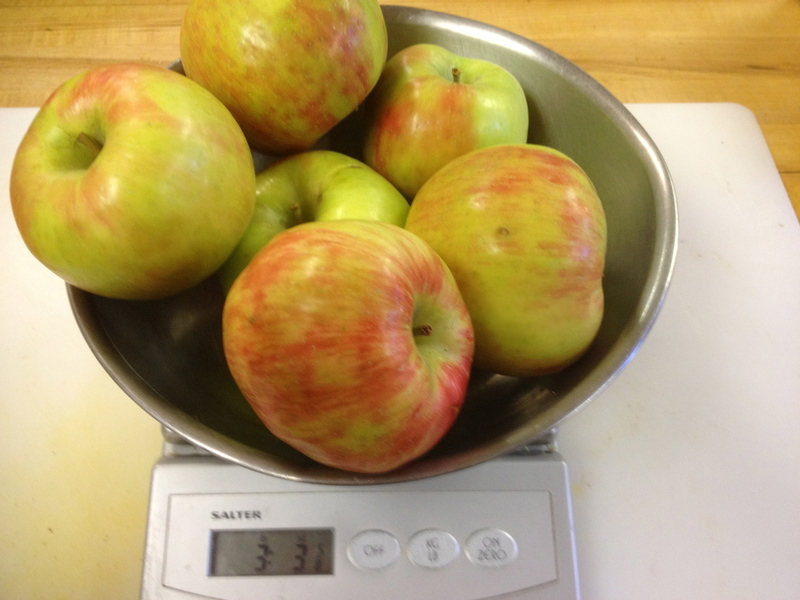 This year, for the first time I picked up a ½ bushel of Honey Crisp Apples at an orchard in New Hampshire. Although not the prettiest apples in the market, they are such great eating apples . After looking them up on line I discovered they are also considered a good baking apple. I decided to take the plunge and experiment with a pie made from the Honey Crisps. This was a true departure for me- I have been faithful to Cortland's since I started baking pies myself. And tradition is hard to break. 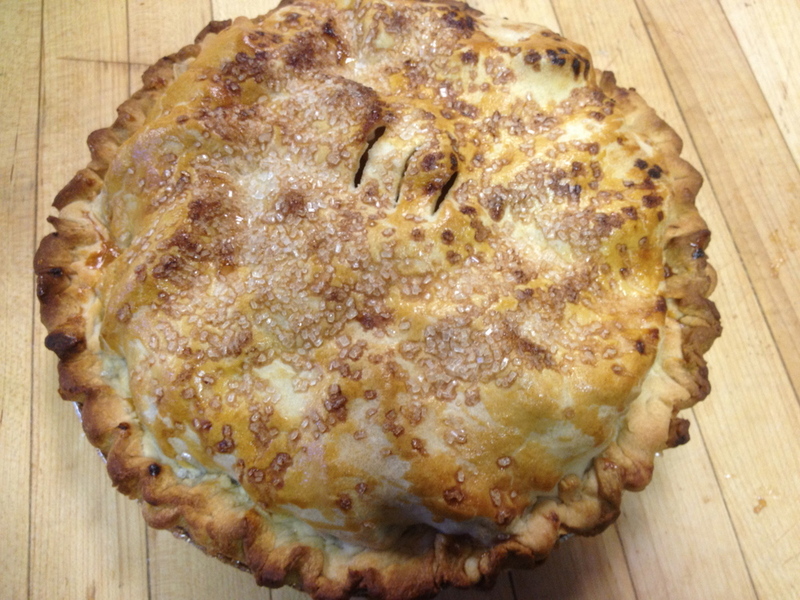 Well the results are in- the pie made with Honey Crisp Apples is a true winner. It is sweet, juicy and really wonderful. If you are able to find Honey Crisps in the market I highly recommend them- but remember Cortlands ( and Mitsus) also make a great pie. Here are a couple of suggestions to help you construct the perfect pie. I used just over 3 pounds of unpeeled apples. Once the apples are peeled,sugared and ready to pile in the crust, I place them slice by slice overlapping slightly. This takes a bit more time than just "dumping" the apples into your crust but results in a pie packed with apples not hollow when you slice and serve it. For a fluted edge on your pie, you need to leave a ½" border when you trim the top crust. Fold the top and bottom crust into the pie and pinch to seal the crust. 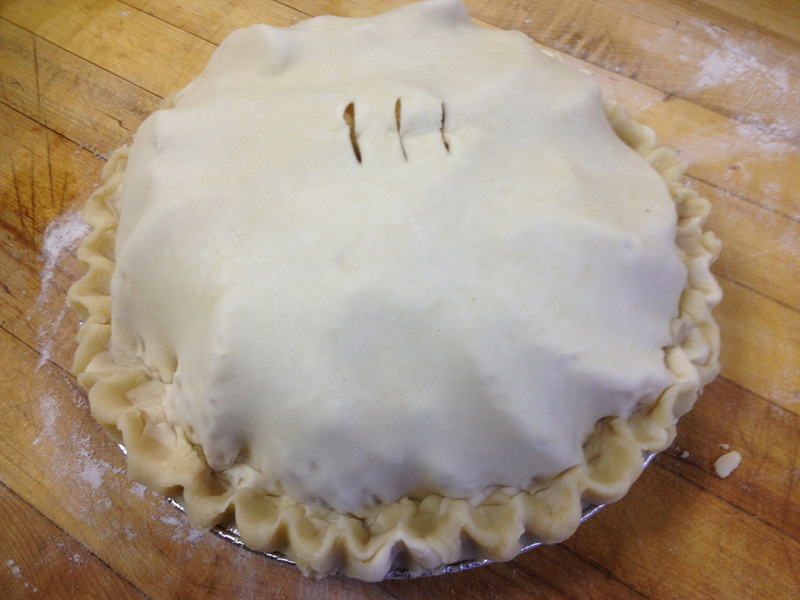 For a simpler finish,trim the dough flush to the edge of the pie shell and press with the tines of a fork to seal. Preheat the oven to 425. Peel core and thinly slice apples into a bowl. Add sugar, corn starch* and cinnamon and toss to coat all the apples. Set aside. In the bowl of a food processor fitted with the chopping blade, place 2 Cups flour and salt. Add the shortening and pulse -10-12 times until the mixture resembles a coarse meal. Add the water all at once and blend until the dough forms a ball. Remove the dough from the processor and dump onto a lightly floured board. Divide the dough in half and form each half into a ball . Roll out bottom crust to 10 1/2" circle and place in 9"deep pie plate. The crust should overlap the edge of the pie plate. Arrange apples in concentric circles in the pie plate. If there is any juice in the bottom of the bowl pour it over the apples. Place the butter on the top of the apples. Roll out the top crust 1 1/2" larger than the pie. Fold the crust in half and cut three slits in the center as steam vents. Carefully lift the crust onto the apples, centered and trim excess dough leaving 1/2" around the side. Turn the edges in and form a flute with your fingers, or seal the edges with the tines of a fork. Place the pie on a baking sheet. Brush with a mixture of egg and water and sprinkle with sugar if desired. Bake at 425 for 15 minutes . Drop the oven temperate to 350 and con tune baking 25-30 minutes until apples are tender. I use cornstarch as a thickener in pies made with Honey Crisp apples but substitute same amount of flour in a pie made with Cortland or Mitsu Apples. Posted on October 16, 2012 by Loree Ogan.